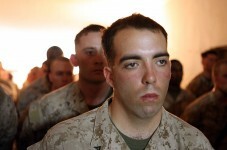 HADITHA, Iraq (June 25, 2006) — Marines and sailors gathered at their forward operating base in Haditha, June 25 to honor a Marine killed in action earlier this month. Marines and sailors from the Hawaii-based India Company, 3rd Battalion, 3rd Marine Regiment gathered to pay their final respects to Cpl. Michael Estrella, a 20-year-old from Hemet, Calif. Estrella was killed by enemy gunfire recently while on patrol with his platoon during a search for a suspected insurgent. During the ceremony, Marines described Estrella as a “dedicated and professional Marine” who excelled at his job of being a radio operator. He often went without sleep to make sure his company had communication with all required units. The Hawaii-based Marine infantry battalion arrived in Iraq about three months ago to replace another Marine battalion conducting security operations in this region along the Euphrates River. Estrella’s unit frequently patrols Haditha, a city still active with insurgents, to provide security to the region’s people. The day he was killed, Estrella volunteered to go on the mission to ensure the platoon had operable communications, according to the Marines here. Estrella was a 2003 graduate of Hemet High school and joined the Marine Corps in September 2003. He reported to 3rd Battalion in May 2004 and deployed with the unit to Afghanistan in support of Operation Enduring Freedom last year. His awards include the Purple Heart Medal, Combat Action Ribbon, National Defense Service Medal, Afghanistan Campaign Medal, Iraq Campaign Medal, Global War on Terrorism Service Medal, and the Sea Service Deployment ribbon. The Hawaii-based battalion, also known as “America’s Battalion,” arrived in March and is scheduled to depart Iraq this fall and be replaced by another Hawaii-based unit.